There are 8 people looking at this page. The bus is likely to sell out today. Last booking: 58 minutes ago. Note: To enable a field, the previous field must be filled. No fuel charges. No toll fees. No hassles. It only takes 2 minutes. Driving yourself can cost over $50 in fuel... each way! If you take your own car, expect to pay over $17 in tolls. Let us do the driving. Arrive relaxed and ready for fun. Our modern buses are equipped with reclining seats, large tinted windows, and clean restrooms. Yes. Bus tickets are likely to sell our every day. Also, the bus will not stop at a departure area unless an advanced reservation is made. Can I pay for my tickets on the bus? No, you can not pay for tickets on the bus. Advanced reservations, payable with a credit card are mandatory. For your security, the driver will not allow passengers on the bus without a prepaid ticket. No, cash is not accepted. You must pay for your ticket in advance with a credit or debit card. Prices start at $35. An additional charge my apply for travel at certain times of the day. $10 is also added for service to Universal Studios. $15 is added for service to Disney World. Book online at orlandomiami.com. Or, call us at 1-(305) 249-1631. After booking, you will immediately receive an email confirmation containing your receipt and itinerary. FRAUD CHECKING: Note that in order to best serve our customers, we have fraud protection in place to ensure that stolen credit cards are not used. Your IP address will be logged. Proper id is required for boarding. Is it necessary for me to print my receipt? No, a printed receipt is not necessary to board the bus. The driver will have your name on the manifest and will be expecting you. What if I don't receive the email confirmation with my receipt? If you don't see the email confirmation in your Inbox, check your Spam or Junk Mail folder. You should also try performing a search in your email account for the phrase: OrlandoMiami. If you still can't find the email, contact us and we will resend the confirmation. Can I come to your office? No, our office is not open to the public. Our aim is to give you the best possible prices. We don't have an expensive office, so we can pass on these savings to you. However, we are available everyday from 9:00 AM to 7:00 PM to discuss your travel. To speak with us, simply call our Travel Planners at 1-(305) 249-1631. Or you can complete our email form and one of our representatives will contact you. How many bags can I take? You may bring 2 pieces of baggage (not weighing more than 50 pounds each). Is there a round trip discount? Yes, save 5% off your total purchase when you book a round trip ticket. How do I make a round-trip reservation? Below the booking form, click the "Round Trip" link. What are the vehicles like? 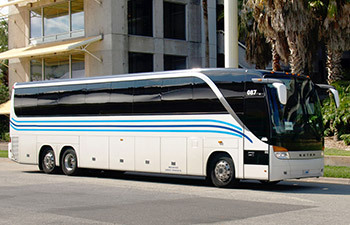 The air-conditioned motor coaches can accommodate up to 60 passengers. They are current models manufactured by Van-Hool. 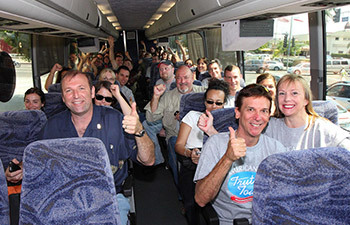 All motor coaches are equipped with restrooms, as well as onboard movies. The vans accommodate 14 passengers and are air conditioned. They are current models manufactured by Ford and Chevrolet. Seating is based on a first come, first serve basis. Are food and beverages allowed? Yes, food and beverages are allowed, but alcohol is not permitted. What are some good items to bring on bus? Smart phone, tablet computer, MP3 player, headphones, books, magazines, camera, snacks, and an a travel pillow. Do you allow cell phone use? Cell phone use is permitted but is limited with respect and courtesy to your fellow passengers. Do you offer Wi-Fi service? Wi-fi service is offered by some of the carriers at their discretion. Service is not guaranteed. Am I allowed to carry my child on my lap during travel? A child younger than 24 months is considered a lap child and does not need to pay for a seat. As per federal regulations once a child is older than 24 months, they are no longer considered a lap child and a seat must be purchased in order for them to travel. Yes, with a letter of authorization from the child's legal custodian. Is there a bus from Orlando to Port of Miami? Yes, Trip 2 and Trip 3 will take you directly to Port of Miami. The arrival time is 11:35 AM & 12:45 PM. 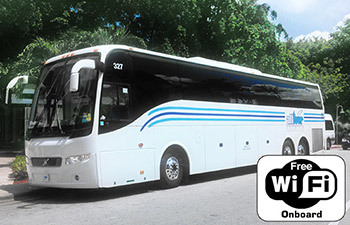 In addition, our bus stop in Downtown Miami is located 2 miles from the Port, and taxis are readily available. 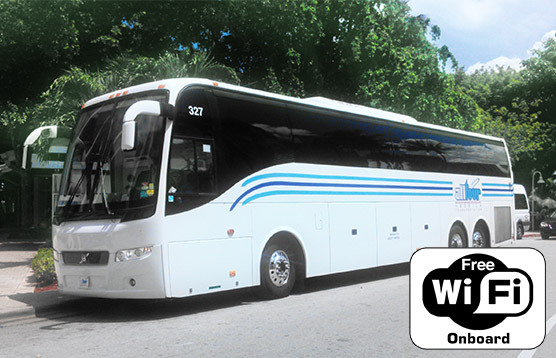 For departure times, see the bus to Miami schedules. How far in advance should I buy tickets? Orlando is the most popular vacation destination in the U.S. Bus tickets do sell out. To ensure a seat, please buy your tickets at least 24 hours in advance. Note: Reservations made after 9:00 PM for the next day are not guaranteed.